The majority of the users praised the superb comfort they experienced while wearing the Adidas NMD_XR1. The stylish and modern design of the NMD_XR1 is very remarkable, said many buyers. This stylish pair often runs true to size. It is available in the market in multiple colorways. A handful of users noted that the NMD_XR1 is a great all around shoe. They praised the versatility of this sneaker which is great for light training to strolling. Few users adored that this pair is easy to slip on. Many buyers shared that they would definitely recommend this pair to their friends. Some users revealed that this pair is easy to suit the daily style. A perfect pair for everyday use. Many wearers commended the lightness of this low-top sneaker. Some buyers criticized the slightly expensive price of the Adidas NMD_XR1. This running-inspired kick feels a little bit wide, criticized by some testers. The NMD_XR1 is inspired from a prior iteration, the NMD_R1. Adidas added a perforated premium leather cage where the lacing system is attached for a lockdown fit. The breathable mesh upper, meanwhile, is rested completely on the Boost midsole for energized strides. This casual running shoe with a sleek and futuristic style surely delivers unparalleled comfort and lightness that can work as all-around footwear. For sneaker fans who are looking for a perfect kick to stand out, the NMD XR1 is a definitely smart choice, despite its slightly expensive price range. In 2015, Adidas thought of launching a design not specifically for any sport, but just for cruising along the streets. That idea gave rise to the well-celebrated line called the NMD. The first NMD, aptly called the Adidas NMD Runner, was a breakthrough design of Adidas veteran designer Nic Galway who visualized a design that has a unique profile that is very identifiable even from afar. Galway also wanted to create shoes that every part has a vital function and removing it won’t make things work. He then took inspirations from the archived shoe models of the brand and modernized it. Galway incorporated everything he wanted in a shoe - simplicity, and functionality. What does NMD stand for? It stands for Nomad, a member of a community that lives in different locations, moving from one place to another. This is the vision of Nic Galway. He wanted his shoe to be worn by people who are in constant travel. They practically constructed a shoe that fits the nomadic lifestyle of this generation - a life without boundaries. By delivering optimum comfort and lightness, the NMD is not far from being the most sought-after choice of footwear by the modern wanderers. Like any other famed shoes, NMD has been resold as much as $1000US. The high demands for this shoe are not due to the people collecting them, but for people who are actually using the sneaker- children, tourists, and workers. The high demand reflects the comfort this shoe delivers to its wearers and how established the association of NMD with the general consumers. The first Adidas Originals NMD that was released was the NMD_R1 in 2015. It was inspired by the running shoe fit for the urban lifestyle. Adidas incorporated the Boost sole technology for the ultimate underfoot comfort and endless energy return with every step. The soft upper of this pair molds entirely to the wearer’s foot and snugly securing it in place. NMD_R1 was designed for aesthetics and city cruising rather than athletic performance. Although patterned from a running shoe, the R1 is not suitable for long-distance running. This shoe is not designed for sudden changes in foot direction. The NMD_R1 will always be exceptional in comfort but not in the performance. Adidas Originals just released the tad bit streamlined version of the NMD_R1. The NMD_XR1 was launched in 2016 with an enhanced look, strength, support, and comfort. The street-ready style of the NMD_XR1 successfully combined science and fashion in a piece of innovative footwear. The high-top Adidas NMD_XR1 Winter sneaker displays a bootie construction to give its wearers a sock-like comfort. This model is made of thick knitted mesh on its upper that hugs the feet comfortably and delivers warmth and protection suitable for the colder days. Aside from insulation, this sneaker has a water-repellent capacity that will keep the feet dry when being used all day. Meanwhile, the high-top sock-like style of this model is reminiscent of the Adidas Tubular Doom, adding more appeal for many fanatics. Fanatics of Primeknit and Boost will surely enjoy the comfort, lightness, and on-trend look of the NMD_XR1 Primeknit. The minimalist aesthetics with breathable upper and cozy elements make this an outstanding choice for day-long use, especially when exploring cities after cities. The brand offers this in various colorways in which buyers can choose from, such as Oreo, Olive-Black, Pink Stripe, and many more. This model is best when paired with cuffed jeans to amplify its exposure to the onlookers. The Adidas NMD_XR1 gives the wearers a modern-day looking shoe with a comfort that is exactly like a sock. The bold street look of the shoe allows this pair to be worn in any casual occasion. This shoe has a breathable and stretchable mesh upper and is lightweight, making this perfect for the all-day wearing. Also, the premium leather caging system adds aesthetic beauty and futuristic appeal to this popular silhouette. The modernized tongue is higher than the collar creating an illusion that it is a mid-cut profile. It has a premium leather heel patch and labels on the tongue to maintain its lifestyle theme. Adidas presented several colorways of the Adidas NMD_XR1 in the market. Here are few of the most popular pairs in the market. This monochromatic sneaker features grey and metallic silver resting atop a white Boost midsole and grippy rubber outsole. The heel counter and the tongue label are in grey leather, and the heel pull tab has the typescript "The Brand with the Three Stripes." This iteration displays monochromatic dark hue from Primeknit upper down to the black rubber outsole. This model also presents a black protective cage, heel leather element, the EVA midsole plug with traces of red found on the heel tab and stitching at the rear end. This model was launched together with the Adidas NMD_XR1 Navy Blue and Adidas NMX_XR1 Grey in 2017. This model boasts its Primeknit upper with contrasting woven pattern to add texture and unique style. The Black colorway comes with the grey caging system while the blue and the grey both come with black caging. This safari-inspired sneaker features unique aesthetics by adding stripes throughout the upper. The black and white fusion seamlessly generated hype for the sneakerheads that will surely elevate their usual casual attire. Released in 2016, the Duck Camo Pack was introduced in three camouflage colorways - Black, White, and Green. The upper of these sneakers are printed with soft camo prints contrasted with soft suede tongue and heel patches. This Adidas NMD_XR1 exclusive for women features the classic look of the NMD_XR1. It showcases grey-based colorway fused with clear Onix and solid grey Primeknit upper. The upper sits atop a white Boost sole and white outsole. This tonal sneaker features a blue upper seated atop a white Boost midsole and sesame-colored rubber outsole. This seasonal-colored sneaker is perfect to keep your chilly days warm in style. With this pair's futuristic style, it is easy to strut the cold season in style. This running sneaker displays camo design throughout the upper resting on top of a pristine white Boost midsole and pink outsole. The print on the upper displays fusion of grey, ice purple, and off white to give an exciting aesthetic to attract more onlookers. This all-white NMD_XR1 presents all shades of white throughout the upper giving a hot, crisp mesh upper with white leather overlay cage. To make it appear cleaner, the brand used the Boost midsole with white EVA plugs. Styling the Adidas Originals NMD_XR1 sneakers is relatively easy as it displays a versatile look that can match almost any casual attire. Most of the wearers like to pair the NMD_XR1 with joggers and shirt for a clean and sleek style. Dressing up or down with the NMD_XR1 to get a fresh look and loads of comfort is considered a breeze. The Adidas NMD_XR1 has the protective premium leather caging overlay. This leather cage is integrated with the lacing system to provide a secure fit. The XR1 model has a sock-like construction. Thus there is no significant cushioning present in the collar and tongue. The pull-tab is found on the heel to aid the users in wearing this on. Meanwhile, the Boost sole of the XR1 is precisely the same as the other NMD models. It provides a very comfortable and responsive cushioning to its wearers. The Adidas NMD_XR1 runs true to size and offered in men’s and women’s sizes. The Adidas Originals NMD_XR1 for men are offered in sizes 6.5 to 14 while the Adidas NMD_XR1 women’s sneakers have sizes 5 to 13 US in medium width. 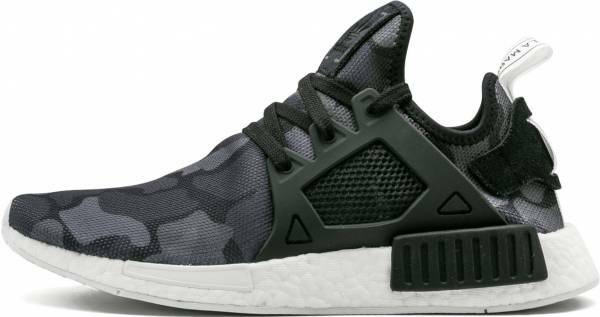 The women’s and men’s Adidas NMD_XR1 Runner casual shoes feature premium leather caging system with perforated side panels over the Boost cushioning. This cage is attached to the lacing system to reinforce the containment and secure fit of the foot. The signature feature of the NMD was altered a bit in the XR1. Adidas streamlined the front EVA midsole plug in the NMD_XR1. They used the outline of the plug to replace the chunky plug used in the previous model. However, on the back and the medial area of the shoe, Adidas decided to retain the thick Lego-like plug. Another striking feature of the NMD_XR1 is the minor tweak in the pull tab. Adidas decided to weave the heel pull tab through the leather heel counter. This minor change was noticed and loved by many NMD fanatics. The caging system found in the NMD_XR1 is not only responsible for the foot containment but also provides resistance to abrasions. The Boost insole and the cushioning of the NMD_R1 and NMD_XR1 are exactly the same. They both have the same comfort and feel. The rubber outsole of the R1 and XR1 are precisely similar except for the color. The NMD outsole provides excellent ground traction, but not ideal for foot movements that need sudden changes in direction. The debossed Adidas Trefoil leather branding is woven on the tongue.